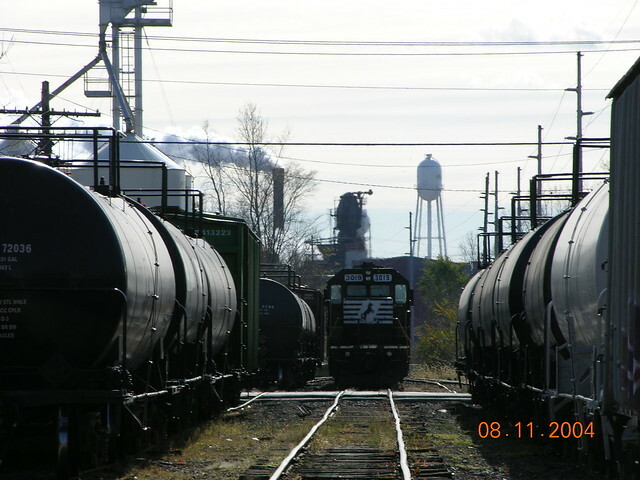 The Kendallville Terminal Railway Co (KTR), a wholly owned subsidiary of Pioneer Railcorp, operates 1.1 miles of track in Kendallville, Indiana. The railroad’s principal commodities are sugar and syrup. The KTR primarily serve the Kraft plant at the end of the line. According to the Pioneer Railcorp website there is also a team track facility available. You can download the railroad’s track plan (in PDF format) directly from the Pioneer Railcorp site, which will come in handy for you should you decide to model the railroad. In the meantime I’ve included a graphic above with details to get you started and to help you place yourself for the overview in the following sections of this article. The Kraft plant has 390 employees and makes Jet Puffed Marshmallows, Marshmallow Crème and caramel products. The plant is one of Kraft Food Group’s most competitive operations and the only facility producing those products in this region for Kraft Foods Group. 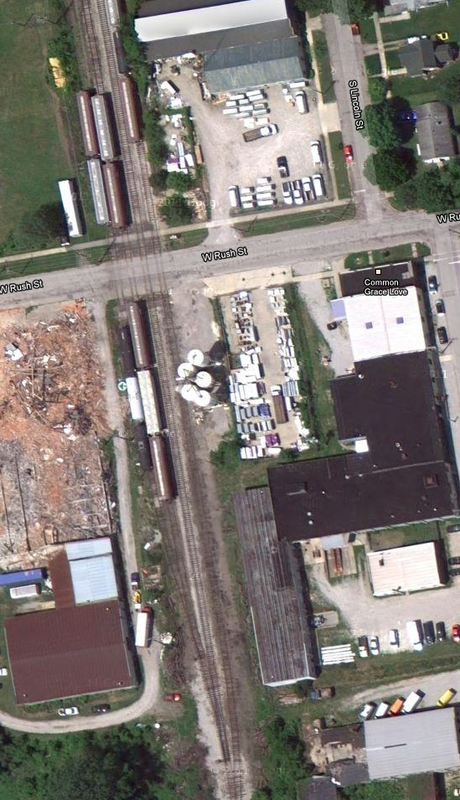 There is a team track facility which I cannot find specifically, so I’m assuming is located within the yard area. Finally there is a salt transload facility at the top right end of the yard. I saw information on a board post (that I cannot find) and on this image that they use the salt for water softening. I believe that this is still in operation. If you’ve already downloaded a copy of the map, then you can follow along and view the entire line using either the map or the images provided here. There is an NS Office in town (at the top centre of Image 1 below with the brown shingle roof). Please note that the images are presented below oriented from the most Northerly (Image 1) to most Southerly (Image 5). The KTR mainline begins on the curve (south) away from the NS mainline and interchange. 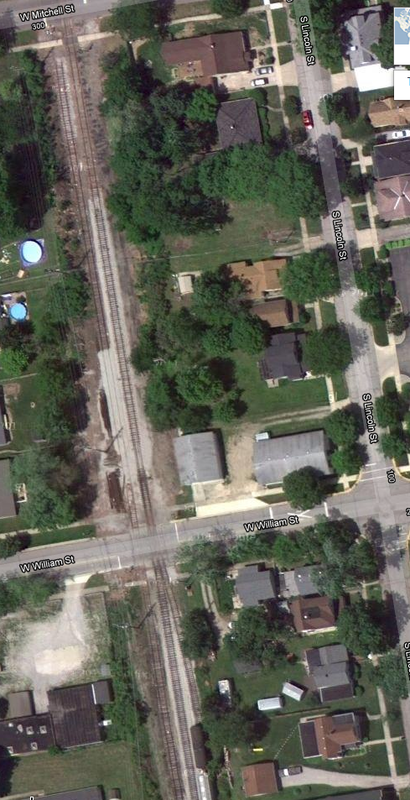 The mainline then crosses West Mitchell St, continuing on to cross West William St. You’ll note the stub-ended yard track to the right of the mainline; this yard track ends just before crossing W Mitchell St. According to the track layout from the KTR website this track switches back into the KTR main, but I cannot find the switch in the imagery available. As you travel further on the KTR mainline you approach the first of two siding switches at West William Street. This double ended siding feeds the transloading facility (used for salt transloading into trucks). To the left of the mainline there’s an additional double ended siding now (see notes above as I cannot find the north end switch). This siding ends near the W William St end of the block. The four yard tracks are split by and cross W Rush St; there is some very picturesque open space on the left in image 3 that gives great opportunity to model a demolished building, or a cleared semi-concreted site. Added to that is the fenced yard on the right behind the silos and you have a signature geographic locator for anyone who has visited the site. 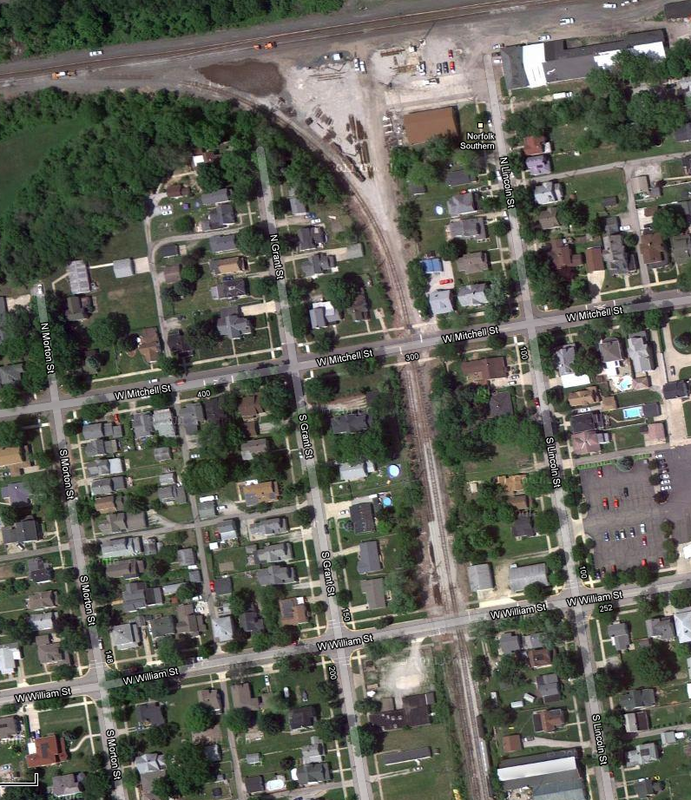 Heading further south of W Rush St all four tracks merge back into the mainline before crossing the water course (creek) which is the dark green strip running across the middle of image 4 above. Just below the houses at the bottom of the image the line crosses Drake Road before travelling around 450 metres south past the site of Mahoney Foundries. It is my understanding that this closed but is now operating again as Mahoney Foundries corporate headquarters. The boxcar is not a boxcar but a bay window caboose. At one time the Mahoney Foundries’ site connected to the KTR mainline (according to this site) but the spur into the site has been long removed and the site has no interest at this time in using rail as a delivery method. But it could be connected as a receiver of foundry sand should you choose to make it so. The KTR mainline continues south toward W Ohio St and the Kraft plant. Just to the north of the grade crossing is a facing point switch leading into the factory. 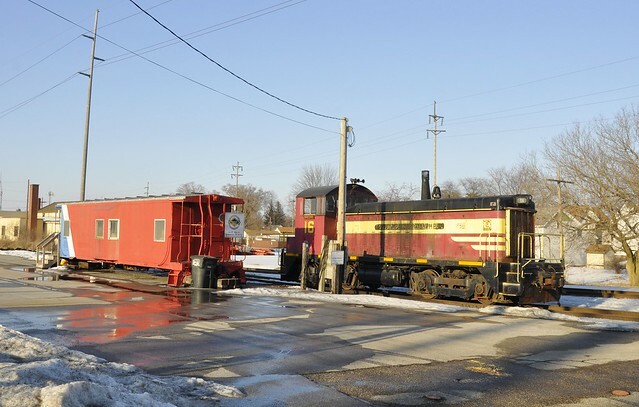 The KTR offices (in a grounded bay window caboose) are just north of W Ohio St as well as the engine storage spot; this is so very modellable as shown in image 6 below. The NS local drops cars off at the KTR yard, picking up empties before returning to the junction. 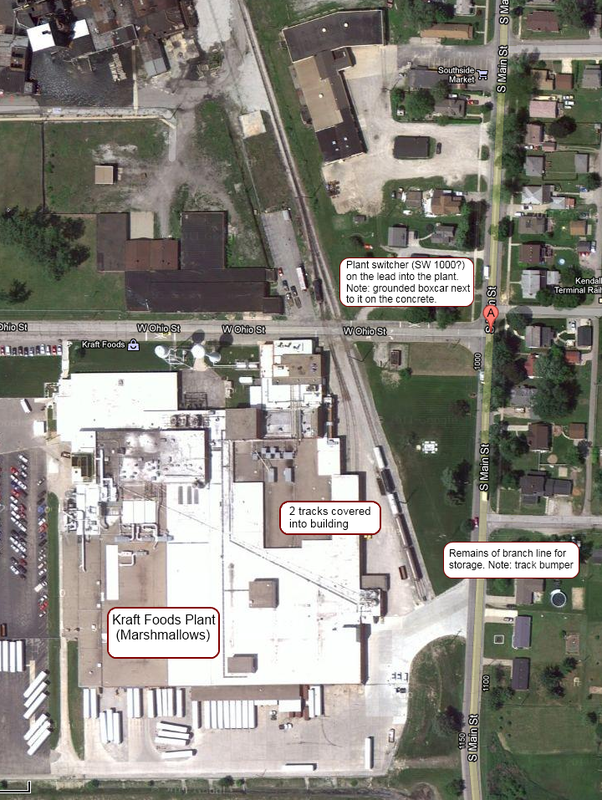 Kraft will have earlier called in the car requirements for the day to the KTR head office so the KTR crew will pull the required cars from the yard for the Kraft plant before pushing into the location. At Kraft the KTR pulls empty cars from the plant, using the branch as the switching lead, before spotting the loads into their respective positions. The empties are now moved back to the yard, tied down for the next day’s interchange with the NS. Any extra work involving the team track, salt or other moves for the Kraft plant would be completed. The KTR does lend itself to a great modelling experience; primarily it is simple. You have one large and a couple of small customers. Has only one locomotive and a simple set of freight car requirements. With a total of 1.1 miles of trackage you can model a significant amount of the line should you have a railroad room to use. In N Scale you’ll need just over 11 metres. In HO scale you’d need 20.3 metres to cover the entire line, but with a focus on either the plant or the yard you could still model a half mile of trackage (the most interesting parts) in the same 11 metres room space. Even in US O scale you can get in just a hair under one-third of a mile in the same N Scale room; in O scale 1/3rd of a mile is a lot of room. As much as I like to railfan and watch my trains run, when I have to choose between running or switching – I’m going to go for switching. Should I have the room I’ll choose to have both; linear run is always a problem for me so switching it usually is. Where space is at a premium I’d focus on switching the Kraft plant, and the Inglenook it represents.With a little more space the option would be to model the yard (in a shortened form) and the plant. in this case I’d use the yard as the fiddle yard too. Should you be able to devote more space, adding distance between the yard and the plant you’ll get more bang for your buck. While you could use the extra length for some run in from a fiddle yard, I’d rather have isolation between the yard and the industry continuing to use the yard as both a scenic yard and a fiddle yard. You can argue for and against a separate fiddle yard. Using the yard as the fiddle yard I believe that you can work the railroad without any loss of operational fidelity. Really there’s not that much to the railroad in model form. N scale – produced by Life-Like in the past. O scale – produced by Atlas O, but may be out of stock at the moment. Check with your local hobby shop or the manufacturer for stock levels. If all else fails head to eBay or another online auction site. Corn syrup tanks, sugar (bulk pressure differential) covered hoppers, and whatever other cars you can find proof of will work for you here. As for the salt traffic I am not certain, but you can see that pressure differential cars might be the best option here. In the photos there seem to be many on the railroad and no-one will complain if that is what they see. For the rivet counters if you know what types of cars can be put into this service would you let me know? I’ll update this page with any comments you can give. All of the images I’ve used so far are from either Bing or Google Maps. There is unfortunately no Google Street View data in and around the Kraft plant which would be nice (are you listening Google?). Luckily, there are many and people whose cameras have recorded the KTR. Firstly a big thanks goes out to Mike Keiran (of Port Able fame) for giving the impetus to get this article finished. Actually I should thank his mail server for not accepting the zip file and stopping me from sending him all the images. As for the KTR well what do I like about it? It’s short, it runs 60-year-old power in the modern era, there are few car types required. 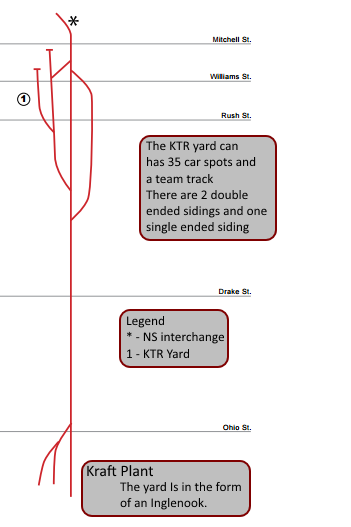 It has a 35 car spot yard, includes a team track and has a transload capability. Would you like fries with that; or just some marshmallows?